Is it Safe to Store Food in a Pressure Cooker? 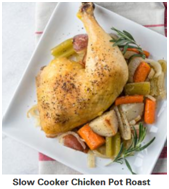 The best slow cooker also known as a crock-pot is an electrical appliance that sits on the countertop in the kitchen to simmer foods at a lower temperature than broiling, frying, baking. They are a wonderful convenience for stews, soups, chili, pot roasts, and other tasty dishes such as desserts. They are used by everyone globally. Slow cookers and best crock-pots have been around since the 1970s and seem to have died out for a while but are making a return to home kitchens to save people time from their hectic schedules. Slow cookers are practical, easy to use, and are nice looking. 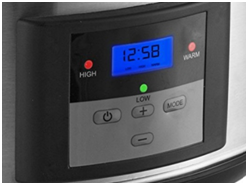 The programmable slow cookers are time savers letting you be gone or do other things at home. We love them so much because they don’t need a lot of attention and our presence standing at them. They are inexpensive for the most part, yet can be pricey depending upon the features you want. Slow cookers provide convenience for people who like home-cooked meals, but are on tight time schedules. These small appliances have evolved over the years to include timers and more stylish designs, but the functionality of them has remained the same. Use these suggestions for how to use a slow cooker. Fundamentally, a slow cooker has a round or oval cooking pot made of glazed ceramic or porcelain. It will have a lid made of glass or metal. The unit, or housing that holds the pot is usually metal with an electric heating element and cord to plug into the wall outlet. The lid seats on the top to give a low-pressure seal to the contents inside via the condensation inside. 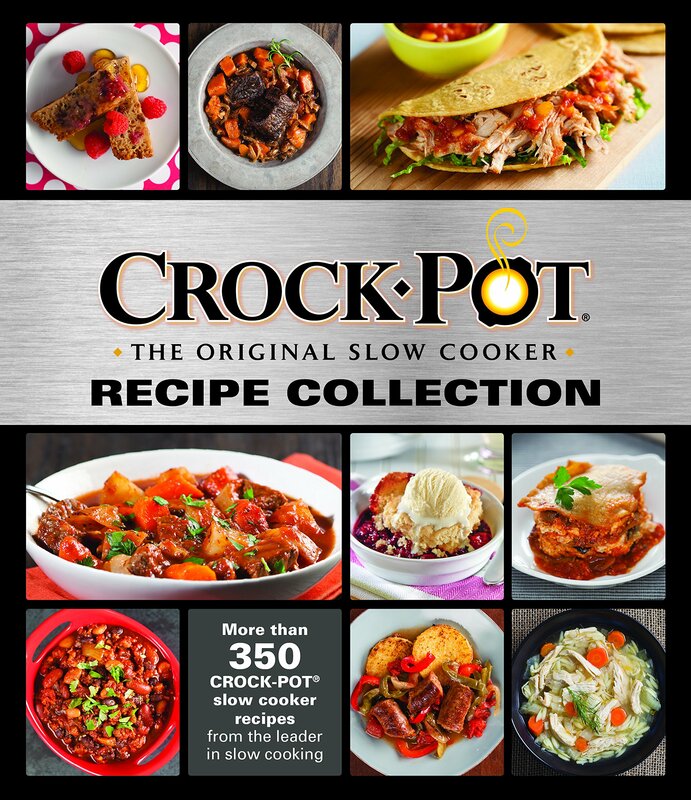 A crook-pot, slow cooker is not the same as a pressure cooker. The ceramic pot, or ‘crock’ is both a cooking vessel and a heat reservoir. Size—many are available in 17 ounces (500 mL) to 7.5 quarts (7L) and up. Most have a liquid recommendation and cannot be filled completely to the top with fluids. This has to do with how the heat is controlled. Heat Settings—most slow cookers have low, medium, and high settings and some will have a ‘keep warm’ mode. Some have a continuous adjustable power and some have no controls for temperature with a constant heat to the food inside. Programmable rice cookers are used as slow cookers. Advantages—using Inexpensive cuts of meat such as Chuck, sirloin, and other roasts of beef and pork provide for more tender cooking and stewing with superb flavor. The food will seldom burn and if not overcooked, vegetables will retain their savor. Cleaning—is a snap by using only one pot and the porcelain or glazed inner pot can be easily washed by hand and some can go into the dishwasher. Cost—is anywhere from about $30 to $200 depending on the features, size, and material it is made from. You could spend much more on toaster ovens, broilers, and convection ovens. You can save up to 50% on groceries when you buy cheaper cuts of meat. They will cook up fork tender with a delicious flavor by adding vegetables and spices. If you are vegetarian, vegan, or diabetic, you will save tons of money preparing dried beans that never need to be soaked rather than tin cans of beans cooked to mush. Energy Savings Equals Dollars Saved—with a slow cooker/crock-pot. Did you know that a 250-Watt slow cooker will save you money when not firing up your oven that draws 4000-Watts of electrical power? You will save another potential 50%. You will also save more money using the leftovers for the kids’ lunch and your own lunch. Health Conscious—people want to cook “real” food at home saving money and time with the benefits of vitamins and minerals. You will never need to add butter, fats, or oils to clog up your arteries. Just trim the fat off you meat and chicken before using. Your food will never taste greasy and the individual flavors of carrots, celery, onions, garlic, and other veggies will shine through to your taste buds. Cooking Slow is Easy—because you just layer in your food, set the cooker for the time you want, and it’s waiting for you when you’re ready to eat it. Cleaning the Cooker—is effortless. Put the crock pot and lid in the dishwasher and be done. Wipe down the housing with soapy detergent, rinse, and towel dry, and you’re done. Storing the Crock Pot—is a no brainer. It can be stored in the refrigerator with its lid on top. Be sure to let it warm up before heating so the ceramic doesn’t crack or break. Read your instruction booklet for this direction. Most slow cooker/crock-pots will cook up oatmeal, granola, couscous, all meats, vegetables, and some will cook desserts. Rice can be cooked, but remember, it doubles in size when cooked. If you use 1 cup of dry rice, it will cook up to be 2 cups. If you want a separate rice cooker only for rice, see them here. The Instant Pot® Duo Series brand is Amazon’s choice style designed in Canada. The model IP-DUO80 is a best electric slow cooker with many more functions to include making your own yogurt. The cooker is also available in 3- and 6-quart sizes for the needs of your family or just yourself. With its 1200-Watts, you have adequate power for all its functions and it is made of 18/8 stainless-steel for the outside housing that is brushed for having a nice mat shine showing no finger prints. The electronics are in the bottom and the bottom housing is 3-ply thick made of food grade stainless-steel composed of 50% iron and 0.8% carbon. 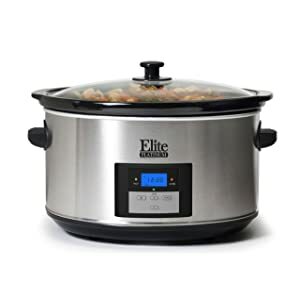 This is the best-selling slow cooker on Amazon.com® today. It is indeed durable and easy to clean with stainless-steel lid and black plastic outside and for the handle. It resists any rusting and there are no chemical coatings. 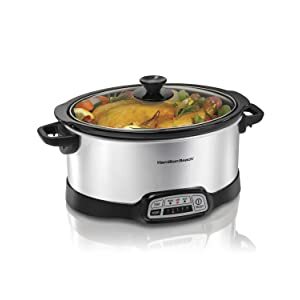 This cooker is so multipurpose with it’s 7-in-1 functions being a slow cooker, rice cooker, pressure cooker, steamer, breakfast hot cereal cooker, yogurt maker, and warmer for leftovers. It browns meat, sautés veggies, and does just about anything. You cannot use this cooker as a deep fryer. Additionally, it is not safe to pressure can with this unit. See pressure canners here for canning homegrown veggies and fruits. On the front programmable control panel are 14 settings for meats like beef and pork, poultry, fish, seafood, soups, stew, chili, beans, with other settings. If you like Jiu Niang rice, this unit will pasteurize and ferment it. 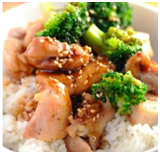 Here’s a great site for how to cook rice with the Instant Pot® here. The cooker has 3 sauté and slow cooking temperatures and you can choose the time from a half-hour up to 20-hours. You can also delay your cooking to start up to 24-hours. If you want to manually set the timer it can be set for 120-minutes with the automatic keep-warm mode up to 10-hours. It can be set manually up to 99-hours. The latest cooker versions do not use manual setting and has been renamed as pressure cook. It beeps when cooking is finished. Your cooking time will be decreased by 70% using the 2 pressure settings so that you can cook 2-3 times faster. Your vegetables will never be mushy when you use the low-pressure setting. Keep all the aroma, flavor and nutrients in your food with confidence. The latest third generation technology has a microprocessor to monitor pressure, temperature, keep time, and adjust heating intensity and duration to achieve your desired results every time. If you are a yogurt lover, heat the milk for fermentation in the pot or jars with milk. Add nuts and fruits for what you enjoy in your yogurt using your best electric slow cooker. The cooking pot, lid, and steam rack are dishwasher safe. Do not put the housing in water; just wipe it clean. It has a locking lid and thermal overload protection for safety. The stainless-steel rack has handles for easy lowering and lifting food in and out of the pot such as tall asparagus spears or corn on the cob. The rack is handy and can go into the dishwasher for cleaning. The Instant Pot® does not compromise your safety. Plug the 35-inch 3-prong grounded non-detachable UL® listed and ULC certified cord into a USA 110/120-Volt, 50/60 Hz outlet. Outside the USA and Canada, you would need to buy an adapter for 220/240-Volts. The dimensions are 14.80- x 13.19- x 14.02-inches and weighs 15.79-pounds. Gift-wrapping is available for your loved ones and friends at birthdays, holidays, in dorm rooms, apartments, and special occasions. You will receive a User’s Manual, and included accessories of the stainless-steel steam rack with handles, rice paddle, soup spoon, measuring cup, condensation collector and recipe booklet with a 1-year Limited Warranty. The User’s Manual and instructions are in English, Spanish, French and Chinese with cooking time tables. 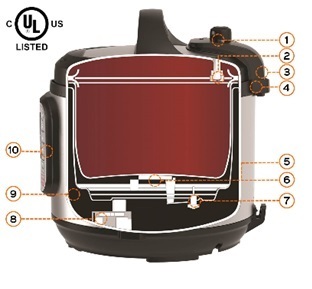 The Instant Pot® pressure cooker is made in China and distributed from Ontario, Canada. 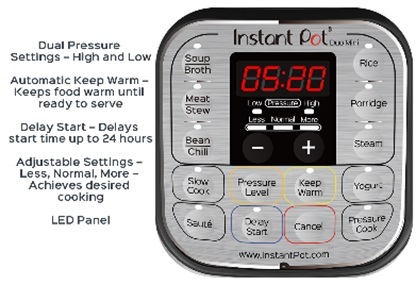 Instant Pot® 8-Quart Honest-Review video. 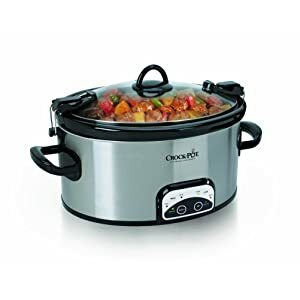 The Crock-Pot® Cook and Carry™ Slow Cooker model number SCCPVL610-S-Aof brushed stainless-steel with its timer settings that you program will do it all for you with your busy schedule that keeps you on the move. You can unplug the cooker and take it with you to an event or family gathering to plug back in and keep the food warm. The lid is hinged and locks with easy-to-carry handles. A top handle lets you easily remove the lid. With the seal’s compression to stay in place, nothing will spill out when you put it in your vehicle to take somewhere. The lid has a vent hole to let steam escape. The 6-quart slow cooker will hold a 6-pound piece of meat, ham, or chicken and will serve up to 7 or more people. You can set the cooker to run from 30-minutes to 20-hours and once the food is cooked, it will automatically change to the ‘warmer’ mode to keep it hot. The stoneware oval bowl inside can be taken out and used as the serving dish on the table. For what your timetable demands, you can set it on ‘high’ to cook from 4 to 6 hours or at ‘low’ to cook from 8 to 10 hours. You can now forget about it cooking, and when you get home, your food will be fresh and hot. The instructions say that the removable stoneware is ovenproof and microwave safe. Do not use removable stoneware on gas or electric burners or under the broiler. The tempered glass lid and stoneware interior bowl are dishwasher safe. Never put the housing in water. It can be cleaned easily with warm dish detergent and water. The dimensions are 15 x 10 x 15.2-inches weighing about 8-pounds empty. It is BPA-free. Plug the 2-foot UL® listed 2-prong cord into a USA 110/120-Volt, 50/60 Hz outlet at 240-Watts. Countries outside the USA will need to purchase a 220/240-Volt adapter. Or buy from Amazon.com® for 240-Volts. Gift-wrapping is available for a special occasion, family, and friends. You will receive a User’s Manual and a 1-year Limited Warranty. The cooker is made in China, Mexico, or other countries. The Cuisinart® multicooker model MSC-600 lets you use it as a slow cooker, a steamer, or simply brown and/or sauté. The cooker is available in 4-, 6-, and 7-quart sizes. It is lovely to look at made of a gleaming stainless-steel style with black handles. This is a bit more expensive yet a best seller on Amazon.com®. It has lots of features including a steam rack. The inner pot is nonsticking and will go into the dishwasher along with the lid and steaming rack. The high-quality cooker has 3 preset modes so that you can sauté and steam using them. The 24-hour slow cooking function will automatically go to the ‘keep warm’ mode after your slow one-pot cooking time has completed for tasty hot meals. It has a low beep tone when the cycle is complete. There is no ‘delay start’ feature because there is no clock. This cooker also creates delicious desserts. The inner aluminum cooking bowl goes directly to the table to serve from. The inner pot is a scratch and chip resistant diamond coating and is not Teflon®. The coating is PTFE- and PFOA-free. It is recommended not to use metal utensils but to use wood, nylon, bamboo, or plastic to keep the surface from scratching. The tempered glass lid has a stainless-steel rim and black plastic handle that is cool to touch. It does not have a lid latch. Make dry bean or split pea soup with a hambone, roasts, chicken dishes, chili and spaghetti. Cheaper cuts of meat to save you money will cook up fork tender. You can also cook any type rice in this cooker. The inner pot cannot go into the oven or be used on any cooktop surface—it will break. You cannot use this cooker as a deep fryer. The dimensions are 1.5-inches long x 20.5-inches wide x 9.75-inches high weighing 17.75 pounds. The cubic feet are 1.59. Plug the 44-inch UL® listed 2-prong polarized cord into a USA 110/120-Volt, 50/60 Hz outlet. Countries outside the USA will need to purchase a 220/240-Volt adapter. Or buy from Amazon.com® for 240-Volts. 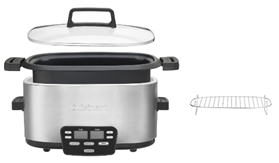 At a maximum of 1500-Watts, this slow cooker uses a lot of energy at high heat. Since many North American homes have 15-amp circuit breakers, if you’re planning on running this appliance on a circuit with other appliances, there’s a good chance you’re going to keep blowing a fuse or breaker; 1500-Watts is 12.5-amps, so you do the math before plugging this into the wall outlet. Unplug other appliances before using this cooker. It does not run at 1350-amps continuously, only when heating up. Gift-wrapping is available for a special occasion, family, and friends. You will receive a User’s Manual, recipe booklet, and a 3-year Limited Warranty. The cooker is made in China. 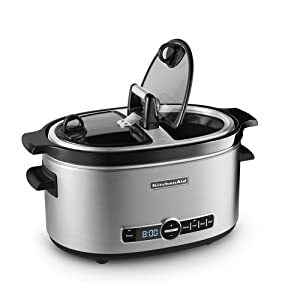 The Maxi-Matic Elite Platinum slow cooker model number MST-900D has a timer, is digitally programmable to 20 hours, with a brushed stainless-steel housing. The removable stoneware pot can be taken to the table and stored in the refrigerator and then reheated in the microwave. Prepare an assortment of foods to include pot roasts, chili, soups, rice pudding, and other desserts. With its low, high, and ‘keep warm’ settings, you can confidently go away and it will make dinner for you to be ready when you return. The oval shape is lovely to sit on your countertop. The glass lid is tempered and will not break. The cooker has cool-to-the-touch plastic handles and lid knob. The dimensions are 11.5-inches wide x 11-inches long and weighs 15 pounds. Plug the 4-foot UL® listed cord into a USA 110/120-Volt, 50/60 Hz outlet at 280-Watts. Countries outside the USA will need to purchase a 220/240-Volt adapter. Or buy from Amazon.com® for 240-Volts. Gift-wrapping is available for a special occasion, family, and friends. You will receive a User’s Manual, and a 1-year Limited Warranty. The cooker is made in China. 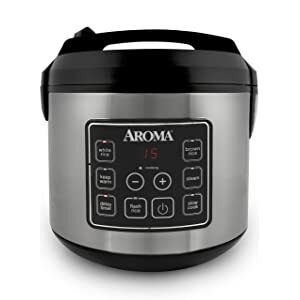 The Aroma® Housewares 20-cup cooked and 10-cup uncooked rice cooker, slow cooker, or food steamer model number ARC-150SB is digitally controlled and cool to touch. The top best seller on Amazon.com® has a 15-hour delay timer, will cook white and brown rice, steam, and slow cook. You can cook rice of any type from 4- to 20-cups. It will cook quinoa, porridge, oats, grits, and cereals and the cooker is BPA-free. Rice and dry beans do not need to be soaked. It will simultaneously cook vegetables and meat while the rice is cooking below. 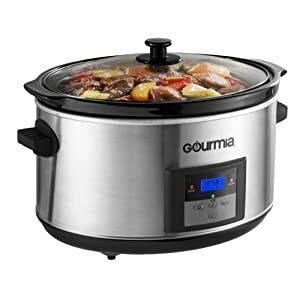 Prepare your most scrumptious dishes such as roast beef, soup, stew, jambalaya, chili, and more in this 4-quart cooker. Food will stay warm on the warming function. You will receive a rice cup, serving spatula, and steam tray for veggies. The lid is hinged so that it opens up, but does not completely come off. The beeper will sound when your food is done. All removable parts are dishwasher safe. The dimensions are 10.83-inches long x 11.22-inches wide x 10.83-inches high weighing about 5 pounds. Plug the 4-foot UL® listed cord into a USA 110/120-Volt, 50/60 Hz outlet at 650-Watts. Countries outside the USA will need to purchase a 220/240-Volt adapter. Or buy from Amazon.com® for 240-Volts. Gift-wrapping is available for a special occasion, family, and friends. You will receive a User’s Manual, spatula, rice cup, steam basket, and a 1-year Limited Warranty. The cooker is made in China. 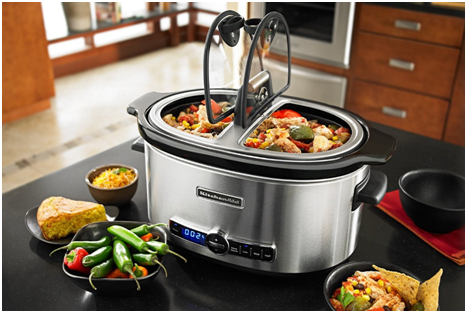 The Hamilton Beach® slow cooker takes the convenience of slow-cooked dishes to a higher level. They get your finished dish to a potluck, party, family reunion, or work event without messy spills. The model 33473 is programmable so you will never need to stir or watch what’s in the pot. The stoneware inner pot is washable along with the lid in the dishwasher. The heating element inside wraps around to heat everything inside evenly. Select the temperature you want from warm, low, or high. When your food has finished cooking, it automatically goes to the warm mode. You can choose from 2, 4, 6, 8 or 10 hours for your specific dish. This pot will hold a 7-pound chicken or 5-pound roast. It is not programmable to set a start time. The countdown timer shows you how much cooking time remains and you can cook from 30-minutes to 18-hours. The dimensions are 9.9-inches high x 17.6-inches wide x 11.7-inches deep and weighs about 12-pounds. Plug the UL® listed cord into a USA 110/120-Volt, 50/60 Hz outlet at 340-Watts. Countries outside the USA will need to purchase a 220/240-Volt adapter. Or buy from Amazon.com® for 240-Volts. 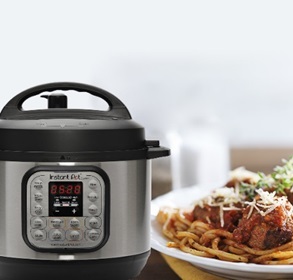 The Gourmia® SlowSmartXpress cooker model DCP760 has multiple programmable functions, and the outside housing is made of stainless-steel in an oval shape with cool-to-the-touch handles and lid knob. The lid is trimmed with stainless steel for a good fit without a gasket. The control panel is lit with LCD (liquid crystal display) lights and easy to see and read. The settings can be low, high, medium, and warm. The temperatures are: Low 98C./208F. 8.5 hours; High 100C./212F. 5 hours; Warm 63C./145F. 6.5 hours. The smart cooker shuts off automatically when the food is finished cooking. It does not have a delayed start function and will cook 20-hours on high or low. See through the tempered glass lid that will not break. The interior bowl is made of black ceramic that never sticks to your food and holds 7-quarts. Remove the bowl from the housing and serve directly on your dining table. It will also go directly to the refrigereator to store with the lid then heat up again in your microwave. The lid and best crock-pot can go into the dishwasher. The pot can go into the microwave but not the lid because it has metal. With its secure feet, the cooker will never slip or fall off your countertop. Take this along to your parties, events, and family dinners. The cooker is a time saver and you never need to watch it cook. It does all of the cooking for you. Simply turn it to ‘high’ for more expensive meats adding vegetables, grains, or pasta. Your bean soup and stews will never cook better on a stove top surface. You will receive a free recipe book with your slow cooker to make soups and cobblers! The dimensions are 11-inches high x 16-inches wide x 11.5-inches long and weighs about 12.2-pounds. Plug the UL® listed cord into a USA 110/120-Volt, 50/60 Hz outlet. Countries outside the USA will need to purchase a 220/240-Volt adapter. Or buy from Amazon.com® for 240-Volts. Gift-wrapping is available for a special occasion, family, and friends. You will receive a User’s Manual, and a 1-year Limited Warranty for parts and labor. The cooker is made in China. 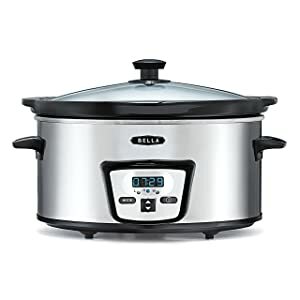 The Bella® slow cooker, parent company, Sensio, Inc., a housewares appliance store, creates Bella® model number BLA13973 slow cooker to improve your time in the kitchen. By scheduling your cook time with the LED control panel from 30-minutes to 20-hours in advance, your dinner will be hot for serving when it automatically changes into the ‘stay warm’ mode. Choose whether you want the low or high temperature to cook your specific food ingredients. You can serve 5 to 6 people with this 5-quart size cooker. The tempered glass lid and black stoneware crock-pot are dishwasher safe. Do not submerge the stainless-steel housing in water. The handles and lid knob are a cool to touch plastic. The inner pot cannot go into the oven. The inner pot is made of porcelain so is BPA- and lead-free. The dimensions are 13.23 x 13.23 x 9.13-inches long and weighs about 13.2-pounds. Gift-wrapping is available for a special occasion, family, and friends. You will receive a User’s Manual, and a 2-year Limited Warranty. The cooker is made in China. 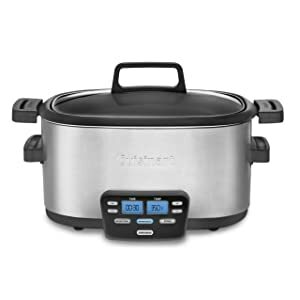 The All-Clad® MetalCrafters of Canonsburg, Pennsylvania, USA, creates a crock-pot slow cooker model number SD 700450 that is oval shaped and programmable holding 6.5 quarts. It is also available in 4-quart. The insert is black ceramic and is lead-free. The housing is polished stainless-steel and the handles on it and the lid are of the same stainless-steel. The lid is made of tempered glass to not break. Do not put the insert in the oven because it will crack and break. The LCD digital control panel is easy to read and set from 4- to 20-hours with its push button controls. The total cycle is up to 26-hours to have your homecooked dinners ready for you right on time. It does not have a delayed start or ‘keep warm’ function. The high mode is 2- to 8-hours and the low mode is 4-to 20-hours. The handles attach to the body for easy gripping and do not get hot. The tempered glass lid keeps heat and moisture inside for tender meat. The lid and insert bowl are dishwasher safe. The dimensions are 14 x 19.87 x 11.38-inches long and weighs about 12.5-pounds. Plug the UL® listed cord into a USA 110/120-Volt, 50/60 Hz outlet at 320-Watts. Countries outside the USA will need to purchase a 220/240-Volt adapter. Or buy from Amazon.com® for 240-Volts. Gift-wrapping is available for a special occasion, family, and friends. You will receive a User’s Manual, and a Lifetime Warranty. The cooker is handcrafted in the USA and made in China. The KitchenAid® model number KSC6222SS is a creatively conceived idea with its side lids to serve right at your table. It is convenient for family use or at events. The see-through hinged lids open on either of its 2 sides. It has a ‘keep warm’ function for up to 4-hours, and can be programmed up to 24-hours in 30-minute increments. Select from the 4 temperature settings to have dinner waiting for you when you get home. It does not have a delayed start feature—seems that would have food spoil if left out without cooking for too long. It does not have a clock, so you cannot set it to start at a specific time. The vessel is not 2 separate cooking units. It is the typical single ceramic cooking bowl inside the housing. The top does not have a rubber gasket seal, but the lid’s outside is covered with stainless steel. The lid is made of tempered glass and the knobs on top swivel to open. It keeps it tightly closed to keep food hot and not spill when taking it with you to dinner events. It can be cleaned in the dishwasher. KitchenAid® does not recommend putting the ceramic insert in the oven, but it can go in up to only 300-degrees F. Breakage is a problem with high heat in an oven. The ceramic pot should not be used in the microwave or on the stove top. The oval ceramic insert is removable and can be cleaned in the dishwasher. The cord will store on the bottom of the cooker. The ceramic bowl insert has tested lead- and cadmium-free and does not require a California Proposition 65 warning. The dimensions are 14.5-inches wide (17.25-inches with handles) x 11-inches deep x 10.75-inches high with lid and weighs about 13.6-pounds. Plug the 29-inch UL® listed cord into a USA 110/120-Volt, 50/60 Hz outlet at 350-Watts. Countries outside the USA will need to purchase a 220/240-Volt adapter. Or buy from Amazon.com® for 240-Volts. Gift-wrapping is available for a special occasion, family, and friends. You will receive a User’s Manual, and a 1-year Limited Warranty. The cooker is licensed in Canada, made in China, and distributed from Detroit, Michigan, USA. The Chefman® model number RJ15-5-N is so versatile, is PTOA- and PTFE-free for the stoneware pot, can be used to sauté over an open flame, put on an electric stove, and can go in the oven to cook roasts. It is dishwasher safe and it’s not glazed inside. The outside housing cannot be put in the dishwasher. Use it to steam asparagus, artichokes, and make rice. 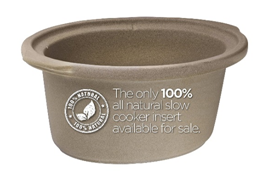 The stoneware insert is natural and will not stick. If yours breaks, you can buy another one. The lid is made of tempered glass to see what’s cooking and will not break. Store your food in the stoneware bowel in the refrigerator, and reheat in the microwave. The inner crock is oven safe up to 400 degrees F.
Low and high settings are both 210 degrees F. The low setting takes about 6 to 8 hours to reach this temperature and the high setting takes about 4 to 6 hours. The warm setting will keep your food at 140 degrees F. It will make a 5-pound roast to serve 5 or 6 people. When you buy this multi-tasking cooker, you will have access to Club Chefman® for easy delicious recipes, cookbooks, videos, and more. The dimensions are 13.3 x 12.75 x 9-inches and weighs 10.8 pounds. The crock dimensions are 10.5-inches long x 8-inches wide x 4.5-inches high. Plug the 4.5-foot UL® listed 2-prong grounded cord into a USA 110/120-Volt, 50/60 Hz outlet. Countries outside the USA will need to purchase a 220/240-Volt adapter. Or buy from Amazon.com® for 240-Volts. Always read the instructions that come with your slow cooker before you use it. All the answers are there. Slow cookers are not pressure cookers. Only put your ceramic bowl in the oven, on the stovetop, or microwave if the instructions tell you it’s okay. The ceramic breaks from high heat as that of an oven or stovetop. Slow cookers usually do not brown meat. You will need to do that in a separate ceramic skillet unless the instructions say your cooker will brown. Don’t overfill your cooker. Usually they can only be two-thirds full. Read your instruction manual. Keep the lid on your cooker. 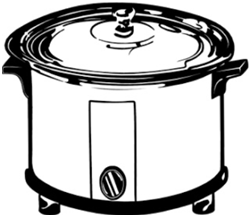 The ceramic insert in a slow cooker can crack if exposed to abrupt temperature shifts. Don’t place a hot ceramic insert directly on a cold counter; put down a dishtowel first. The same goes for using a filled insert you’ve stored overnight in the refrigerator. Let it come to room temperature before putting it in a preheated base. Lids without rubber seals can be wobbly, but that’s not a problem for proper cooking. Use ceramic knives to cut your meat into small pieces for even cooking. If you’ve run out of ideas, try this fun cookbook for about $12 on Amazon.com® here. A slow cooker/crock-pot is a timesaver, versatile, and makes yummy foods for meat lovers, vegetarians, vegans, dessert lovers, and Mexican foods to die for. Read reviews on Amazon.com® to see what others are saying about the specific slow cookers. Make sure you get a good warranty if something should not work or break. Be healthy and save time with a crock-pot slow cooker. The one thing I want to know is whether a slow cooker actually cooks. The units I have seen have as much as one inch between the heater and the ceramic insert, and they will not heat soup to cooking temperature. Fancy features and ease of washing don’t count if the equipment won’t cook food. I’m sorry to hear that your cookers did not heat soup. Why would you want a “slow” cooker to do that? The microwave or pan on the stove would be better for heating up something. 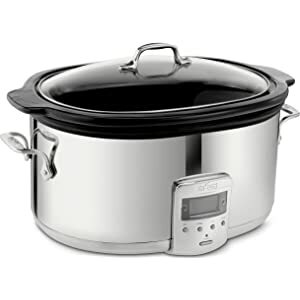 Slow cookers are meant to be used to cook a stew or something all day long while you are gone or doing something else besides standing at the stove. They will cook food. 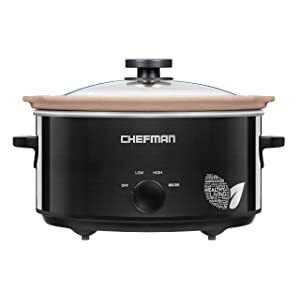 Read the reviews above for the best slow cookers and let me know which one you like. 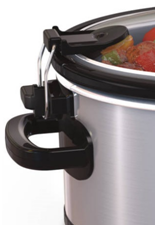 Number 3, the Chefman® 5-quart slow cooker does NOT have a 3-prong plug. I bought it for my husband to teach his kids how to cook and the school requires that plug. In addition, the stoneware insert is not glazed and food sticks to it. Difficult to clean. Your Chefman® slow cooker should be easy to clean being ceramic inside. I would discuss that with Amazon or at the Chefman® website, chefman.com. A 3-prong plug means it is grounded. I apologize for putting 3-prong when it is indeed 2-prong polarized. I hope you can find a good unit for your husband to teach his school kids for how to use. Most are all 2-prong. Cookware Judge Copyright © 2019.